I have literally just eaten two more of these Healthy Chocolate Brownies and I am counting down the minutes to put the kids into bed so I can eat another one. Is that bad? Hmmm. Maybe. I am also counting down the minutes as husband has jetted off to New Zealand for a weekend of fun with friends and I am solo parenting but that is another story. But back to these chocolate brownies. They are AMAZE friends! 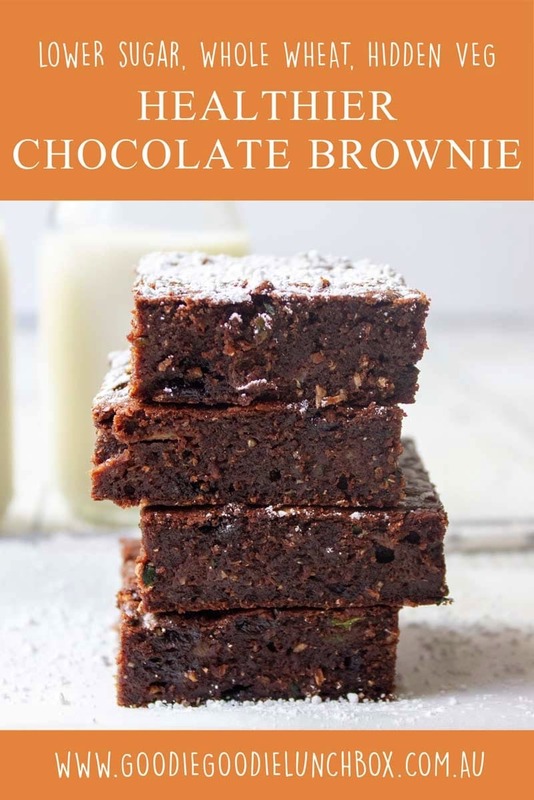 And I just know these Healthy Chocolate Brownies will also be a huge hit with your family. Because: a. chocolate and b. deliciousness – but they also are a healthier option. It’s a win/win people! I am always looking for ways I can sneak a bit of extra nutrition into my kids and reduce discretionary sugars. And I made these Healthy Chocolate Brownies with this in mind. They are lower in sugar than your traditional brownie. These Healthy Chocolate Brownies only contain 1/3 cup of maple syrup and 50g of dark chocolate chips along with a banana as sweeteners. And if you compare this with the traditional 1 1/2 cups of sugar and 200g of chocolate that is normally added to brownies you will see this is a big reduction in sugar! 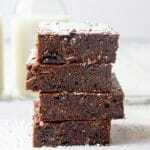 The addition of wholemeal flour and zucchini also boosts the nutrient content of these Healthy Chocolate Brownies. And don’t worry, you can barely see the zucchini and you definitely cannot taste it! If you love healthier versions of baking why not try my delicious Healthy Banana Bread – completely refined sugar free and only sweetened with fruit. 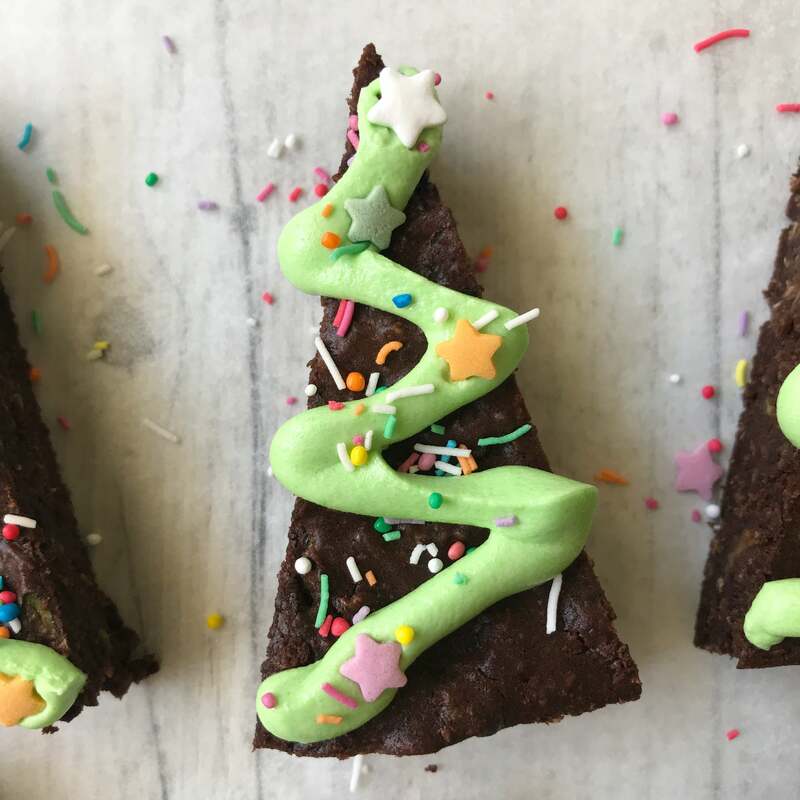 I just love how these Healthy Chocolate Brownies make a fabulous Christmas plate! After baking your Healthy Chocolate Brownies, allow them to cool. Then with a sharp knife, cut the brownie into thirds width-ways. 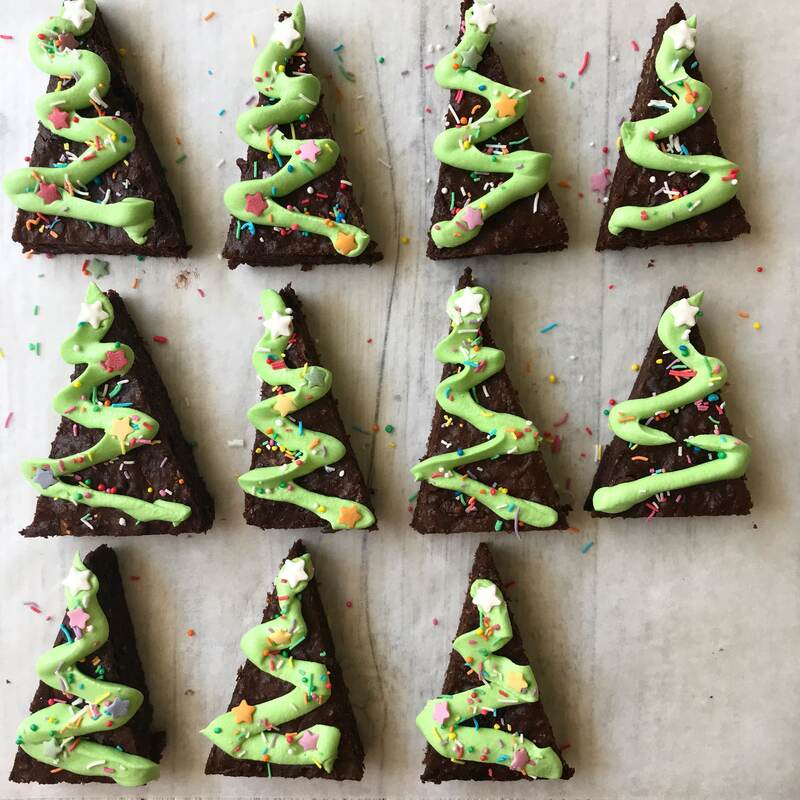 Decorate your Christmas Tree Brownies with piped green icing (I beat 100g softened butter with 1 1/4 cup of icing sugar, 1 tsp milk and a few drops of green icing together to make a delicious buttercream icing) and top with sprinkles and a candy star. Also a tip for you if you do not have a piping bag, just put the icing into a small zip lock bag, seal the bag and cut a small hole in one of the lower corners. Works a treat! 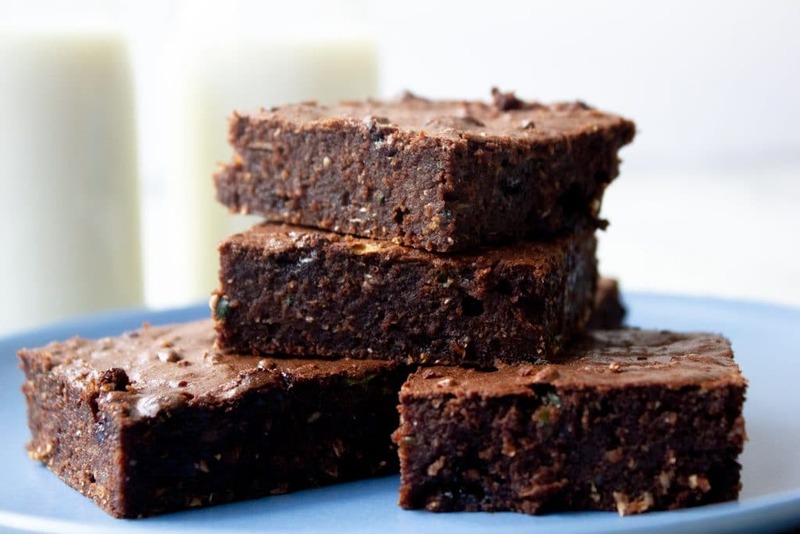 These Healthy Chocolate Brownies are a healthier take on a chocolate brownie. 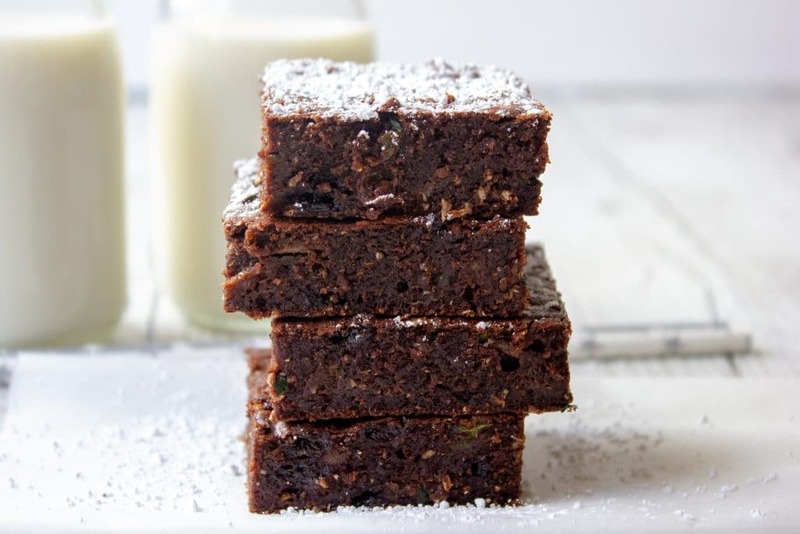 They have lower sugar than a traditional brownie and are made with wholemeal flour and has zucchini added for a nutritious boost. Spread into the prepared slice pan and bake at 175c for around 15 minutes or until the brownie is just cooked through and the top bounces back when lightly touched and a skewer inserted comes out mostly clean. Allow to cool in the pan before removing and cutting into portions. If you are looking for other festive, low-sugar baking check out these delicious Low Sugar Chocolate Rudolph Cookies or these Festive Spiced Cookies. This Healthy Christmas Party Food blog post is full of fantastic ideas and inspiration. 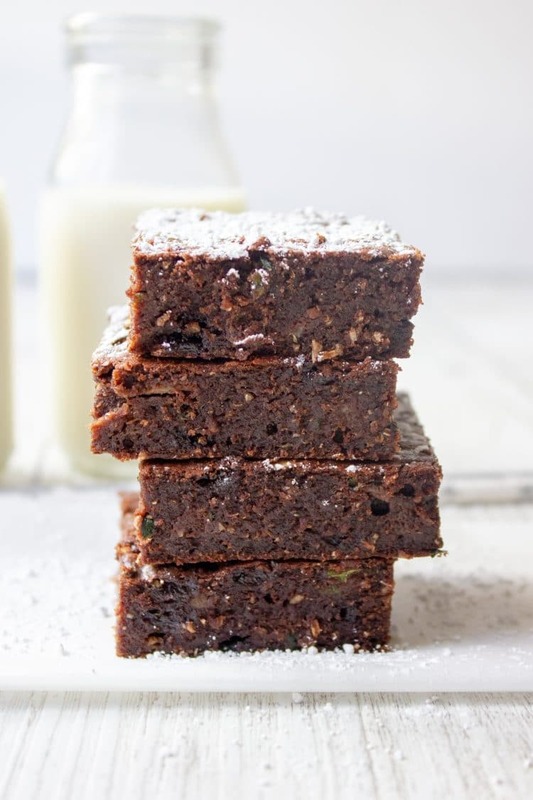 I hope you love these Healthy Chocolate Brownies as much as my family do! As always, if you are baking, please share your pics with me on Instagram or Facebook. What a clever idea to put zucchini in these! That would make them lovely and moist 🙂 Sounds like a great recipe! These are soooooo delicious looking Bernadette!! I absolutely LOVE how you have made them into Christmas Trees as well, that is very creative of you. Yum, I am so going to try these!! Love the idea of hiding the veg, such a great idea! Healthy brownies means I can eat more! Thanks for the recipe! My kids are going to love this one, especially the Christmas trees! Great job Bernadette! Do you think they will come good if i substitute the flour to gf one ? Hi! Have you tried freezing these yet? Yummy yummy in my tummy!! I mean the kids tummy’s!! 🤣 thank you these are devine.